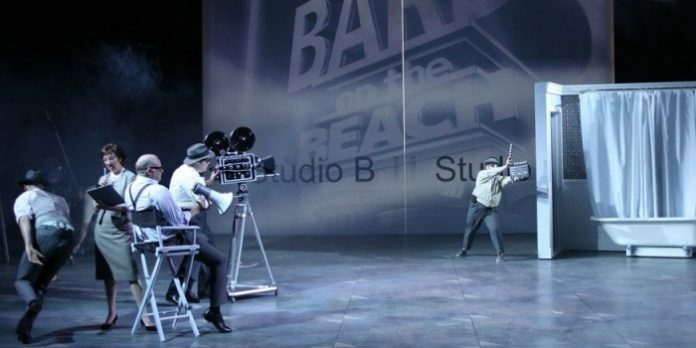 The glamour of a film set, the sophistication of Italy, and the timeless wit of one of Shakespeare’s best comedies — Bard on the Beach has a hit on their hands with Much Ado About Nothing. The show opens in a flurry of revelry with champagne bottles popping and a film crew celebrating the wrap of their latest project. A set of large white doors at the back of the stage serves as a screen for black and white projections and custom retro movie posters. This provides a stylish backdrop to the beautiful black and white costumes by Christine Reimer. A dream team of Scenery Designer Pam Johnson, Lighting Designer Gerald King, Projection Designer Corwin Ferguson, and Sound Designer Murray Price all come together to create a spectacular set that glimmers with silver screen glory and an exciting soundtrack that highlights the action and situates it firmly in 1950s Italy. Director John Murphy played Benedick in Bard’s last Much Ado production in 2010, and Jennifer Lines, who played Beatrice in that production returns to play Ursula for the second half of the summer. On opening night Ursula was played by Lois Anderson who flitted around as a sort of stage manager, always herding people to and fro amidst scene changes. This was a great addition to her character and fit perfectly with this adaptation taking place on a film set. Beatrice (Amber Lewis) and Benedick (Kevin Macdonald) are young film stars who exchange witty banter and have great chemistry – the kind of characters you just know will eventually fall madly in love. Don Pedro (Ian Butcher), a film director, decides that he will try to set them up by letting them overhear that the other is in love with them. Thus we get two hilarious scenes where Benedick hides behind a wardrobe wearing a wig to blend in, and Beatrice conspicuously makes herself as scarce as she can behind a small shrubbery. Both Lewis and Macdonald command the stage with their leading roles, playing these huge, effusive characters so well. Their story shows how thinking that someone loves us can make us love them in return. The other love story doesn’t run as smooth. Benedick’s friend, Claudio (Julien Galipeau), is in love with Hero (Parmiss Sehat), the daughter of Leonato (Andrew Wheeler), head of the film studio. Don Pedro’s sister Dona Johnna (Laara Sadiq) does not approve and plots to fool Claudio into thinking that Hero has been unfaithful. The wedding scene where Claudio publicly humiliates Hero for her alleged infidelity is full of heart wrenching emotion as she wonders what she has done to deserve his cruel treatment. It is a comedy after all though, and to lighten the mood Benedick says, “This looks not like a nuptial,” which breaks the tension. There are many laughable moments, particularly involving two bumbling constables who try to teach an old Italian and a blind friend how to do their job. But perhaps the most enjoyable moment was an Italian song with surtitles shown on a screen above the stage. Mixed in with the Italian lyrics were a few refrains of “Hey nonny nonny.” Coupled with Tara Cheyenne Friedenberg’s choreographic touches, the mood created was perfection. Beatrice and Benedick are hard not to love, and they are perhaps Shakespeare’s most endearing characters. Their love story is born out of their friends’ plot to set them up, but it soon becomes very real. This production takes the essence of their relationship and amplifies it with Italiam charm, mopeds, and cinematic touches.